Many companies are not prepared to deal with DNS attacks, and a quarter of the ones that have already been hit reported significant losses, according to a survey conducted by Dimensional Research on behalf of network security firm Infoblox. Attacks on Domain Name System (DNS) services can have serious consequences, as demonstrated by the attack on Dyn last year. The attack, powered by the Mirai botnet, led to service disruptions for several major websites, including Twitter, GitHub, Etsy, Soundcloud, PagerDuty, Spotify and Airbnb. The study from Dimensional Research and Infoblox, based on a survey of over 1,000 IT and security professionals worldwide, revealed that 3 out of 10 companies have already experienced DNS attacks and in most cases it resulted in downtime. While more than half of the attacks resulted in a downtime of less than one hour, in 6% of cases the downtime lasted for between 8 and 24 hours, and some victims even reported service disruptions that lasted more than one day. 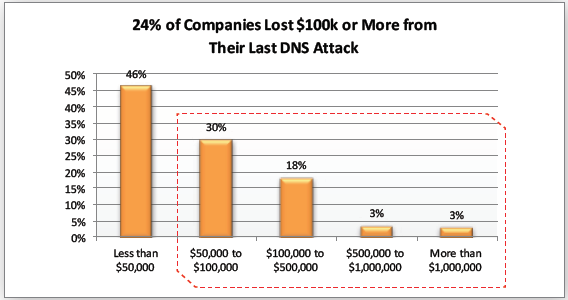 As for the financial losses caused by DNS attacks, 3% of respondents said they had lost more than $1 million, and nearly a quarter reported losses exceeding $100,000. The research has not found any link between the type of DNS service used and the risk of attacks. Companies that used a cloud DNS service, a third-party service or their own service were attacked roughly the same. According to the report, 22% of companies don’t have a backup DNS service, and 63% of them are not capable of defending against all common DNS attacks, such as hijacking, exploits, cache poisoning, protocol anomalies, reflection, NXDomain and amplification. Nearly one-third of the 1,000 respondents said they were not confident their company could handle a DNS attack. However, the Dyn incident has had a clear impact on how DNS attacks are seen, causing one-third of firms to change their DNS security strategy. The survey showed that only 11% of companies have security teams managing DNS, while in most cases the service is handled by IT infrastructure or operations teams. Nearly 90% of respondents complained that their DNS solutions failed to alert them of an occurring DNS attack. “DNS attacks are likely to continue and increase, given that attacks have been extremely successful by impacting the target business 93% percent of the time. This success rate reveals that companies are vulnerable today with substandard DNS tools that are incapable of defending against common DNS attacks or properly alerting teams when they are under siege,” reads the report.